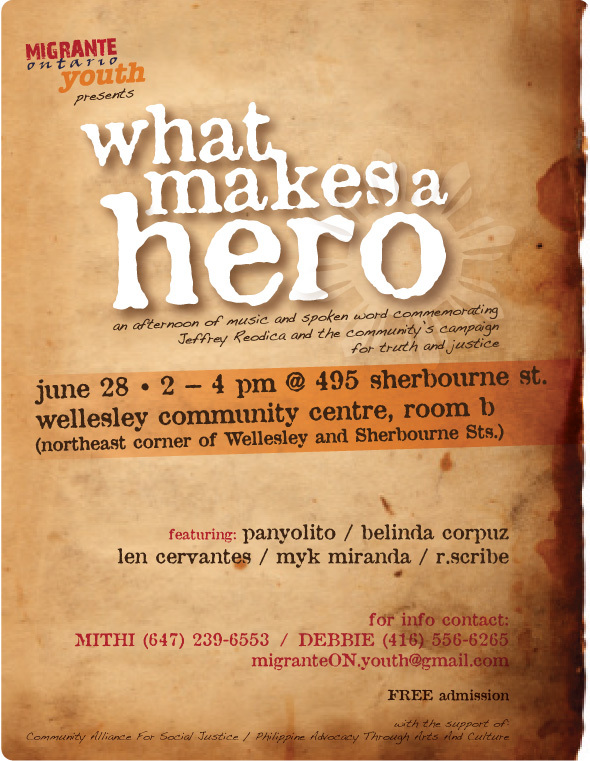 Migrante Ontario Youth, with the support of the Community Alliance for Social Justice and Philippine Advocacy Through Arts and Culture, is holding a cultural event on Saturday, June 28, 2008, 2-4pm at Wellesley Community Centre, Room B, 495 Sherbourne Street, Toronto (northeast corner of Wellesley and Sherbourne Sts.). The event, entitled “What Makes a Hero”, aims to commemorate Jeffrey Reodica and the Justice for Jeffrey campaign, and to update the community on the results of the campaign. Jeffrey Reodica was 17 years old in 2004 when he was shot three times in the back by Det. Constable Dan Belanger of Toronto Police Services’ 41 Division in Scarborough. His death caused an uproar in the community, leading to the formation of the Justice for Jeffrey Coalition (J4J) which held protest actions and succeeded in getting a Coroner’s inquest conducted one year after Jeffrey’s death and generated responses from the Toronto Police Services Board and the Ombudsman of Ontario. Migrante Youth Ontario’s organizers were part of J4J. “What Makes a Hero” will feature music and spoken word performances by young artists in the community, highlighting issues of Filipino youth. There will also be speakers, including members of the Justice for Jeffrey Coalition who will report on the results of the J4J campaign, as well as members of the Reodica family who will give updates on the current status of their legal battle. The event is free and open to the public. Migrante Ontario Youth is also looking for more performers to contribute to the program. For more information and to perform, contact Mithi Esguerra at (647) 239-6553 or Debbie Celis at (416) 556-6265, or e-mail migranteON.youth@gmail.com. Citizenship and Immigration Canada has denied cancer patient, Juana Tejada, her right to stay. Allow Juana Tejada to remain in Canada for treatment and to receive permanent status so she can sponsor her family. We condemn the decision of Citizenship and Immigration Canada (CIC) not to grant permanent resident status to Juana Tejada on the ground of her terminal illness. This is a gross violation of the basic human right to life enshrined in the Universal Declaration of Human Rights and in the Canadian Charter of Rights and Freedoms. Juana came to Canada under the Live-in Caregiver Program in the hope that she and her family would have a better life. Grinding poverty and unemployment in the Philippines push over 2,000 Filipinos out of the country every day. After twenty-four months of serving Canadian society through domestic work, Juana is now eligible to apply for permanent residency. But since 2006 when her cancer was first discovered in a medical exam for her application for permanent residence, CIC continues to deny Juana her right to stay in Canada. A CIC case officer argues that her “health condition might reasonably be expected to cause excessive demand to health and social services,” and thus, an economic burden to the Canadian government. Migrante Ontario, along with other concerned groups, organizations, and individuals, demands that the Canadian government allow Juana Tejada to stay, and to sponsor and bring her family to Canada. In the first place, caregivers should have been given permanent residency status, recognizing the importance and high quality of their service to Canadian society, and the continuing high demand for that service. Juana Tejada fulfilled the requirements, stringent as they are, set in the LCP. She worked in the service of a Canadian family and all in good faith. That she fell ill was not of her own will. All she wanted was to be able to bring her family over, be reunited with them and together share the fruits of her hard work. Yet, the Tejada case and other similar ones clearly demonstrate how the Canadian government treats migrant and foreign temporary workers. While enticing cheap labour from crisis-ridden countries like the Philippines to sustain its own economic progress, it is quick to dispose of those that it considers ” damaged goods after the system has bled them dry. And as the right to life includes the right to medical care, Migrante Ontario insists that the Canadian government continue to provide Juana Tejada, as it would its own citizens, the proper medical service and health care especially in her time of great need.